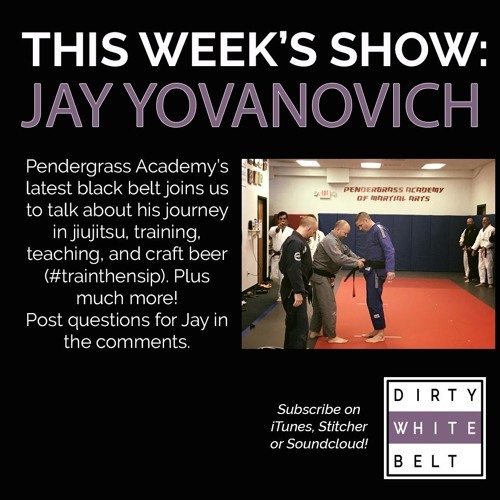 Jiu-jitsu is part of the fabric of Jay Yovanovich's being. The new Pendergrass Academy black belt started his journey almost 17 years ago, and along the way he's become a core part of the Carolina scene and embedded in jiujitsu culture all over. He talked to us about what the black belt means to him, about the training partners who were there at the beginning (some of whom are still around), and about why jiujitsu is an expression of your personality. We also talked about BJJ culture, including Jay's keys to a great rolling playlist and the best craft beers he's traded and received with the Good Vibes Crew. Plus, learn his keys to a great open guard. Thanks as always to our sponsors, US Grappling, Toro BJJ, and Cageside Fight Co.! Register online at usgrappling.com to compete at US Grappling Greensboro on May 20, and if you need gi or nogi gear to compete, find the best products at cageside.com!